It’s the holidays, and you’ve suddenly got a hankering for a badass, actually living tree to fill your apartment with cheer and the smell of the snowy great outdoors. Plus, it sounds like a nice time to venture into the world because you’ve haven’t been outside since October. But don’t be fooled. A gigantic pine tree is a whole different ball game from that big-box plastic trash tree that you pull out from the depths of your storage unit every year. Mother Nature is a cruel mistress, and real trees are unwieldy. Luckily, this guide can help with everything from picking the tree to getting the thing into your third-floor walkup. You’ll be basking in your masculinity and enjoying the gentle twinkle of your lights with a Coors Banquet Beer in hand in no time. Read on. If your idea of venturing outdoors is throwing on your boots and clomping around that dinky “park” next door to your bodega, then I recommend leaving your urban hellscape for a few hours and hitting a real forest. The untamed winter wonderland is a thrill to behold, and you and yours should partake of it at least once this season. Plus, if you’ve got a family, the whole troop will look like cute, fat sausages bundled up in their cold-weather gear. Before you go, read the US Forest Service’s guide to cutting down trees and get a permit from your forest district office. Then, make a day of it and get those little sausages some hot chocolate and pie at a farm stand along the way. Alternatively, tree farms are a good safety if you’re in a hurry or if you’ve got loved ones with you who you don’t want to be cold for too long because they have frostbite-susceptible extremities. 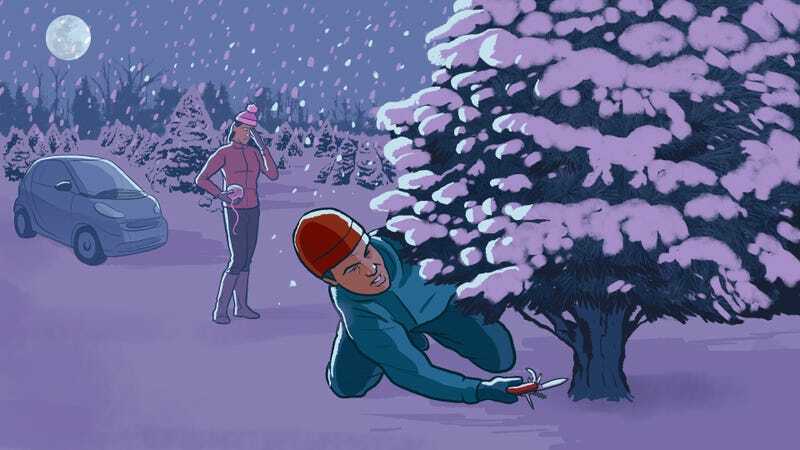 Cut yourself some prepackaged holiday joy at a tree lot or farm. You’ll still be one-upping your neighbor’s grocery-store–grade topiary, which is what the holidays are all about, anyway. Either way, come prepared. Pack your car with a first-aid kit, water and snacks. Don’t bring lunch. Hate to break it to you but nobody wants a soggy, balled-up PB&J. Call the farm to make sure you can actually cut the tree down yourself and how much it’s going to cost. And check the weather! Consider practical implications first. Measure your space to make sure your tree will actually fit, then subtract for a tree topper — your mom’s going to be sad if her heirloom gold star is squashed on top like a heathen. Bring your measuring tape to the farm with you instead of eyeballing it: Trees tend to look smaller with great swaths of breathtaking nature surrounding them. Lastly, inspect your tree for field mice and spiders. It’s the holidays, after all — creatures be stirring. The second consideration is aesthetic. Figure out your tree personality: long and skinny, short and squat, or big and bushy? Think about scent. The basic tree types are firs, pine trees, spruces, and cedars. Douglas firs are nice because they live for a long time after being cut. The smaller, fraser fir smells very fragrant and is a great silvery green, which makes your living room look nice and shiny. Scotch pines have a classic feel, and you’ll find them in a lot of different geographies. A white spruce has short, stiff needles, which is great for decorations. Consider the weather in your home as well, since some trees won’t last in a dry, hot place. Dust off your toolbox and get your tools ready. You’ll need some sort of saw, either a hacksaw or a pruning saw. If you go to a farm, they might have one, but it’s probably some sort of rusty, Cold War–era contraption. Carry work gloves because your poor fingers are going to get cold. If you don’t know how to use a saw, practice beforehand so as to minimize finger loss. Bring a partner to help. The cutter should lie on the ground while the helper lifts up the tree’s bottom limbs and gently tugs on the side of the tree that’s not getting cut, so that the saw doesn’t bind. Saw parallel to the ground, and try for a straight cut, so that when all is said and done your pride and joy will sit evenly in its tree stand. Don’t worry if you don’t get it right; utter failure is part of the holidays, too! Most farms will offer to clean, shake, and net your tree to make it easier to transport. But you’ll still need some rope, bungee cords, or twine to fasten it to your ride. (You don’t want to be careening down Highway 15 only to find out that your precious shrub has fallen, do you?) Lay down a blanket or tarp to protect your car’s roof. Hoist that bad boy up there and strap it down tightly. Make sure to point the bottom of the tree towards the front of the car so that all the needles don’t blow away in transit. You want to get it home looking nice and pretty for the world to see. Ta-da! You’re done! It’s a goddamn miracle! Get that sucker up and display this mark of festive manhood proudly. First thing when you get home, though, make a fresh cut in the trunk so it can soak up water. Then, get the tree hydrated ASAP, making sure that its tree stand is filled with cold water. You don’t really need to mess with things like additives to keep it fresh, but position the tree away from heat sources like vents or fireplaces or else it will dry out. Now, get out there and cut down a tree like your ancestors did! And savor it: This is probably the last time you’ll be outside once Old Man Winter touches everything with his cold, dead January hands. And after you’re all done, remember to wind down at home with a cold Coors Banquet Beer. Being your own lumberjack is tough business, and you’ll need a break. This post is a sponsored collaboration between Coors Banquet Beer and Studio@Gawker.